Several AFC artists lent support to Sketch for Survival, a new wildlife conservation fundraiser in London . This was the first exhibition and auction, part of a wider conservation campaign called Explorers against Extinction organized by UK charity, The Real Africa Trust. 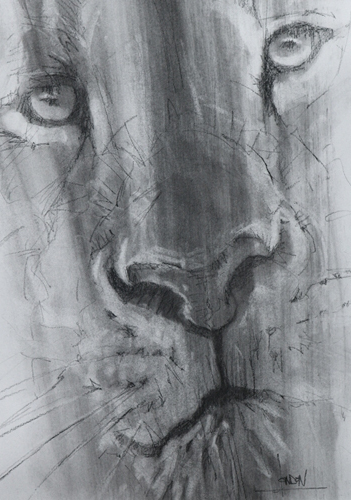 AFC member, Anne London's piece 'Kiongosi', was selected for use on the 2018 Sketch For Survival logo and her Arts For Animals program worldwide will be designated as a Sketch for Survival 2018 campaign partner. Sketches by African children from Anne's Arts For Animals Wildlife Art Center in Zimbabwe will also be featured in the 2018 Sketch For Survival exhibition, which this year will tour the UK, including a week on London's South Bank, before going on to New York. Both programs exemplify how much the powerful link between wildlife art and wildlife conservation can accomplish. The 2017 Sketch for Survival exhibition comprised over 160 pieces of artwork, ranging from 20 minute sketches to complex, time-consuming artworks donated by acclaimed professional wildlife artists across 14 different countries. Also featured were celebrity sketchers, including Dame Judi Dench, Bill Nighy, Stephen Fry,Sir Ranulph Fiennes and Ray Mears. A sell-out audience enjoyed an entertaining evening at London's historic Royal Geographical Society as leading explorers, adventurers, wildlife experts and conservationists, including Sir Ranulph Fiennes and Colonel John Blashford-Snell, came together to make a stand against extinction. Over £40,000 was raised and donated to projects in Kenya and Botswana to help safeguard rhino and elephants. Sketch for Survival 2017 was a huge success thanks to the generosity of artists worldwide and public support in connecting wildlife art and wildlife conservation. Artists from Artists for Conservation played a large part in the 2017 fundraiser's success and it is hoped that even more Artists for Conservation members will participate in the 2018 Sketch for Survival fundraiser. London comments,"This international exhibition is a perfect opportunity for any wildlife artist to make a real difference in the future of our planet's wildlife." This year's Sketch for Survival touring art exhibition and auction, along with a new initiative called Selfie for Survival, aims to fund some brand new and exciting wildlife conservation projects. One of these is in Bardia National Park, Nepal and involves introducing the first ever anti-poaching canine unit to help protect endangered one-horned rhino and tiger. Proud to be a bigger part of Sketch for Survival this year!